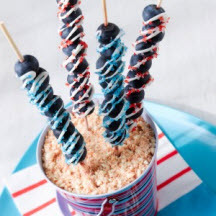 Whether you're picnicking, pot-lucking, or having a backyard Fourth of July party, add some all-American red, white and blue patriotic color to your holiday fare with these terrific foods. 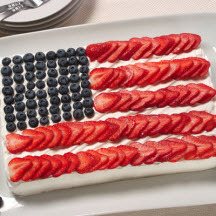 This red, white and blue cake is a classic 4th of July dessert that's a snap to decorate. Add some sparkle to your barbecue, picnic or party with these tasty blueberry treats. 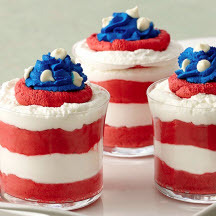 Sweeten your 4th of July barbecue or picnic with a parfait of layered red, white and blue mousse.